1994 不適用 NYPD Blue（英语：NYPD Blue） Duane Rollins 集數："Dead and Gone"
1997 不適用 New York Undercover（英语：New York Undercover） Miles Gordon 集數："The Last Hurrah"
2006 《阿森一族》 The Simpsons Dante, Jr.（配音） 集數："The Mook, the Chef, the Wife and Her Homer（英语：The Mook, the Chef, the Wife and Her Homer）"
2010 不適用 Mercy（英语：Mercy (TV series)） Harold Pindus 集數："We're All Adults"
《青春密語》 The Secret Life of the American Teenager Dr. Wattabi 集數："The Sound of Silence"
2012 《紐約叻女》 Girls Powell Goldman 集數："Leave Me Alone"
2013 《我們的辦公室》 The Office Sensei Billy 集數："Livin' the Dream（英语：Livin' the Dream）"
不適用 Rake（英语：Rake (U.S. TV series)） Alberto Rinaldi 集數："Bigamist"
2017 不適用 Dice（英语：Dice (TV series)） 他自己 集數："Fingerless"
^ Michael Imperioli Biography. Biography.com （英语）. ^ Daniel Pyne. 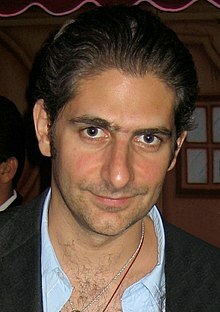 Michael Imperioli Feeds The Hungry Ghosts by Dante A. Ciampaglia. MovieMaker. 2010-10-04 （英语）.